Remembering a lot of accounts and password is a tiring job for a system administrator. Usually there would be a time that you'll forgot a certain password or worst is the log in username itself. Add this with the fact that you forgot to jot it down on a piece of paper or save it on a notepad text for your future reference. So in order to recover the said password (or account), all we need to do is to access the root account and, probably, replace the password you have placed for an Ubuntu account. First thing to do is to reboot your computer. 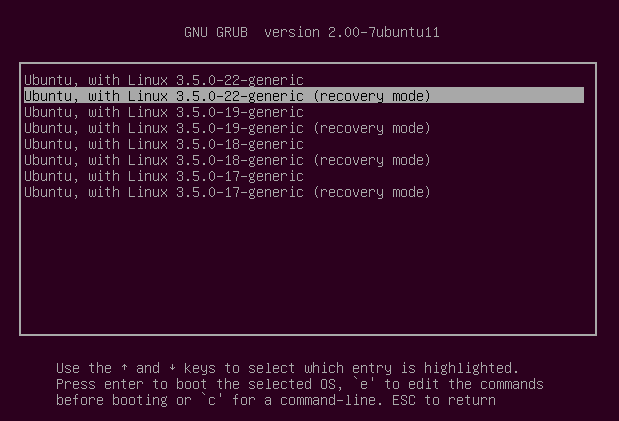 Next is to hold down the Shift key at the start of the boot process in order to enable the GNU GRUB boot menu. See if you can see any line that starts with kernel and append rw init=/bin/bash at the end. Some distro like 10.04 (Lucid Lynx) may have a different set of commands. In this case look for a line that starts with linux and append init=/bin/bash at the end. Press b (or Ctrl+x, depending on version) to boot. Your system will boot up to a root shell without password. Make sure that you know the username of the account that you want to change. Type passwd [username] and you will be prompted to enter and confirm your new password. This should reset your password and now you can normally return to the normal flow.